GoldVu offers you the opportunity to purchase the finest Swiss cast 100 gram gold bars from physical precious metals markets around the world. These Swiss gold cast bars are the most recent addition of gold bar products that have made available to you in an effort to keep improving liquidity in our global physical bullion markets that are encompassed by the Allocated Bullion Exchange. They are cast to a fineness of 9999 (99.99%). The remaining 7 markets offer this highly liquid and sought after gold bullion bar. 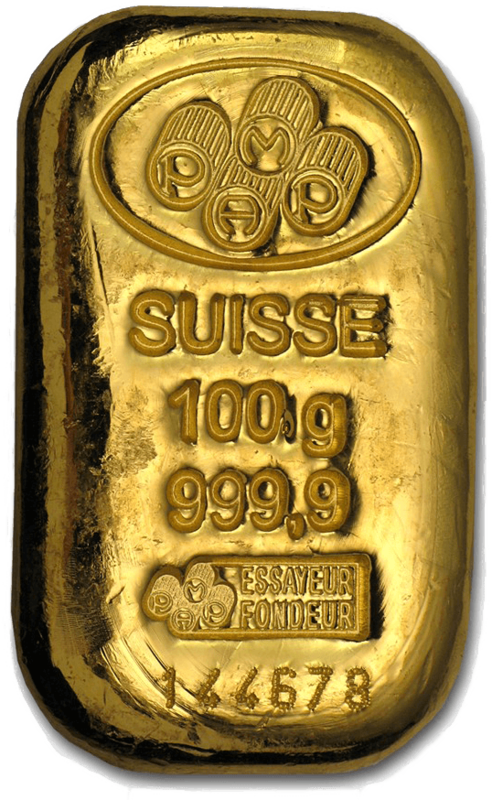 Our new Swiss cast 100 gram gold bars are also the smallest gold bar denomination traded on our physical precious metals markets. The smaller size greatly helps to improve access to those wishing to purchase gold bars as their whole unit price is substantially lower than their larger counterparts that we have available to trade with. Therefore these gold 100 gram bars will likely become one of the most popular entry gold bar for private investors. If you prefer another item then take a look at all of our other gold bullion, silver and platinum products. For those that are used to metric weights please ensure that when you do any conversion calculations, that you use Troy Ounces as they are a different weight unit to just plain Ounces. Trades executed for the 100 gram gold cast bars on the ABX Global markets are done under legal contractual conditions. The physical contract specifications for our Swiss 100 gram cast bar is in the table below. We have provided an explanatory break-down of what they mean separately if you are unfamiliar with any of its terminology. A full list of physical contract specification a pdf that can be either viewed in your browser or downloaded. 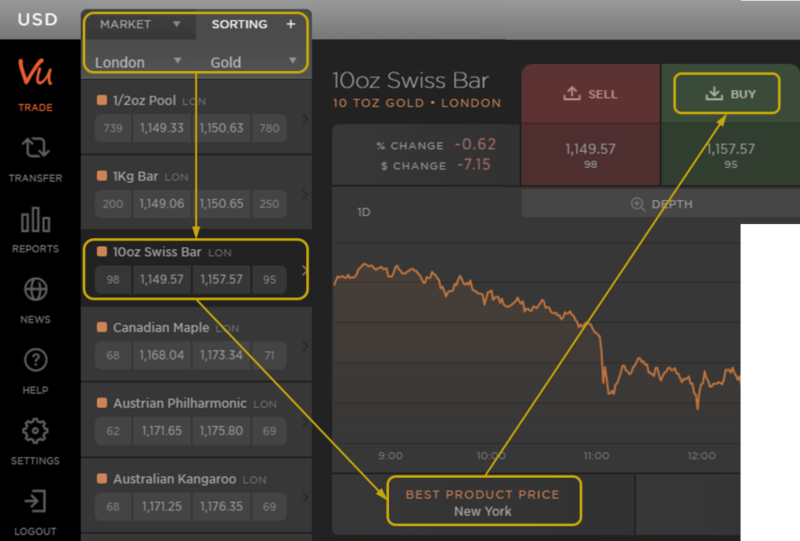 The MetalDesk trading platform that you'll have access to, allows you to find the global market location for the cheapest product item that you are looking at. It also helpfully tells you which product item of that metal type i.e. gold bullion, is the cheapest and its location too. This so that at a glance, investors can identify what and where offers the best value. Any Easier Ways To Do This? Try to think of how you can simplify this process or who can offer you such unrivalled global access to physical gold bullion. Most precious metals dealers / providers will typically only access their own national market to source physical gold bullion, so do you expect to get the best global priced item? With GoldVu, our direct access to the biggest international markets help to get you pretty much the best wholesale gold bullion prices on earth! Why go anywhere else? Don't hesitate to contact us if you want to know more about our Swiss cast 100 gram gold bars or if you just want to start buying and or trading any gold bullion, silver or platinum then just open a Central Holding with GoldVu and either take delivery of your metal or have it safely vaulted overseas in a stable jurisdiction.